My name is Collins from Denver. I had my engine go out and had to have it completely re-done at Express Car Care in Denver. What could I have done to prevent this? You’ve got to feel for Collins; an expensive major engine rebuild is pretty extreme. It’s a tough situation for Denver auto owners to be in: maybe you’re still making payments on your vehicle and nobody wants to buy it with a blown engine, so you really don’t have any choice but to pay the money to get it fixed. This is why your auto manufacturer and Express Car Care have preventative maintenance schedules – to help you avoid major repairs. Suppose you don’t change your timing belt on schedule and it breaks. That can mean bent valves and a damaged cylinder head. Maybe you’ve made the mistake of skipping over the service recommendation to replace your coolant and end up with catastrophic overheating. It could be you’ve skipped a few too many oil changes and now sludge has built up in your engine to the point that expensive parts in your vehicle are being damaged. The best way to prevent having to have your engine completely redone is to check your vehicle’s oil level every month and follow your auto manufacturer’s recommended service schedules. And if you’re behind on any services, just ask your helpful Express Car Care tech to help you work out a plan to get you back on schedule. We’re here to help you, so give us a call @ 303-691-2760 or come in and see us. The Check Engine Light strikes fear into the hearts of some Denver drivers and is totally ignored by just as many. Just what it means is a mystery to most of us in Colorado. First, if your vehicles check engine light is flashing, that means that something is wrong that could cause severe damage to the catalytic converter or other components. Get that taken care of right away. If your check engine light is flashing, you shouldn’t drive at Denver highway speeds, tow, or haul heavy loads. Take it easy all the way to Express Car Care of Denver. If the light is glowing steadily, you should keep an eye on it for a day or two. If the light doesn’t go off, schedule an appointment with your Denver service adviser to get it checked out. Some more information from Express Car Care on how the check engine light works may be informative. Most of your engine functions are controlled by a computer, not surprisingly, called an engine control computer. The computer is able to adjust many engine parameters for environmental conditions, engine condition and even the way you drive in Denver. In order to make these adjustments, the vehicles computer relies on a network of sensors to provide data. The computer knows the proper operating range for each sensor. 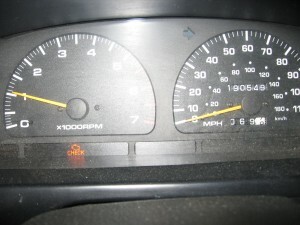 When a sensor reading is out of range, the computer runs some tests and may turn on the check engine light. The computer will also try to make adjustments to compensate for some readings. If it can do so, it will then turn off the check engine light. If the problem can’t be resolved then the light will remain on and you should get your car or truck looked at at Express Car Care. Your service technician will plug a scanner into the on-board diagnostic port and read the trouble code stored in the computer. The trouble code will give your Express Car Care technician a starting place as he diagnoses the cause of the problem. 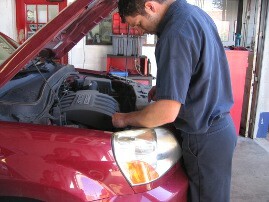 We also offer air conditioning service and transmission service at Express Car Care. Give us a call at 303-691-2760 if we can help with these or any other services. Filed Under: Engine Tagged With: Why Is My Check Engine Light On? Does your vehicle idle roughly while you’re sitting in traffic? Is your gas mileage lower than in previous months or does your engine hesitate when you’re accelerating? Does it have a pinging or knocking sound? These and other symptoms could be trying to tell you that your car is in need of a fuel system cleaning. The fuel system in your car is made up of fuel injectors, intake ports and valves, combustion chambers, a throttle body and the intake manifold. When dirt and deposits get into any of these areas, it can lower your fuel economy, lessen your car’s performance and interfere with the proper operation of your engine. These deposits are a result of burning gasoline and should be removed on a regular basis. If deposits are allowed to build up in the combustion chamber and intake valves without regular cleanings, your engine’s compression is altered. This can cause rough idling, engine stalling or hesitation, loss of power or engine knocking, or engine run-on when the car is turned off. Once you have determined that your vehicle needs a fuel system cleaning, one of our technicians will attach cleaning tools to the fuel system that will clean deposits from the fuel injectors and remove deposit build-up from the intake valves and the combustion chambers. Deposits are also removed from the air intake system, including the throttle body and intake manifold. The fuel system cleaning services the existing parts in the engine so they run like they were brand new. It is usually recommended that you have a fuel system cleaning every 36,000 miles to keep your car running at it’s best. If you have experienced any of these symptoms while driving your vehicle and think you might need a fuel system cleaning, come in and see us or give us a call at (303) 691-2760. Today’s vehicles are equipped with several gauges and lights on the dashboard that are suppose to help us determine if our cars are working properly. 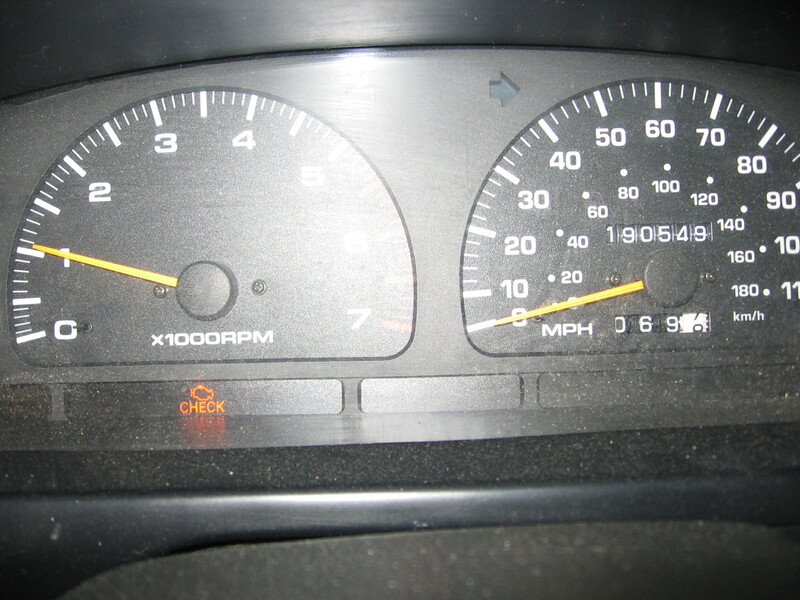 There is a fuel gauge, a check engine light, and an oil pressure warning light. It is very important to pay careful attention to the oil pressure warning. The oil pressure warning light in your vehicle is the warning system that alerts you to low oil pressure. A low oil level can cause the oil pressure warning light to appear, so always check your oil level first to see if the oil level is correct. If you’ve checked the oil level and it seems to be fine and the warning remains on, there might be a more serious problem. Sometimes when your vehicles engine comes to a stop, or drops to an idle, the oil pump, which is powered by your engine, slows down too much and is not pumping enough oil to keep the oil pressure up. If the oil pump is wearing out or isn’t working correctly your oil pressure warning system will engage. Low oil pressure may also be caused by debris that gets sucked up into the oil pump. The oil pump is the only engine component that is continually lubed with unfiltered oil. The oil doesn’t pass through a filter until after it leaves the pump, so any abrasive debris can pass through the pump before it is trapped by the filter. This debris can restrict the flow of oil and reduce oil pressure. A plugged oil filter can be another cause of low oil pressure. When the oil leaves the pump, it passes through the filter before going on to the bearings. All filters create a certain amount of resistance to oil flow, but if the filter becomes too clogged with debris, oil flow will be blocked and cause damage to your engine. The oil pressure warning system may also be activated if the engine is leaking oil from its gaskets or seals. These are a few things that can cause an oil pressure warning. Some are simple or minor repairs if they are caught and dealt with early, but they can become more serious and cause extreme damage to your engine if they are ignored. So have a trusted mechanic or auto repair technician check it out right away. For all of your Denver Auto Repair needs, trust Express Car Car. Call (303) 691-2760 or stop by our shop today. One of the most commonly asked question among drivers is, “Why is my check engine light on”? Although this is a simple question to ask, it’s not always as simple to answer. All of our vehicles are equipped with a computerized engine management system (ECM) and the check engine light is a part of this system. The ECM alerts us to possible problems inside the engine or inside the transmission that have an impact on the emissions system. Check engine lights may be a graphic of an engine or a similar icon. It can also be words, “check engine” or “service engine”. Some vehicles use a yellow check engine light as a caution light that tells you to have your vehicle checked soon and a red check engine light that means your vehicle needs immediate attention. Every car’s display is different, so it’s a good idea to make yourself familiar with how your particular make and model of vehicle works. 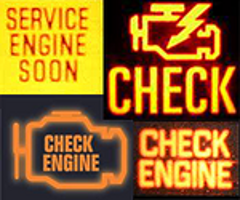 The check engine light is usually amber or red in color and has two stages, a steady light or a flashing light. A steady check engine light signals minor problems, while a flashing check engine light usually means there is a serious problem in the ECM. The cause of why your check engine light is on depends on your particular issue, but here are some general malfunctions that cause the check engine light to come on. A misfire in your engine. A misfire can cause catalytic converter damage if it’s not resolved quickly. The catalytic convertor works to reduce exhaust gases. It converts carbon monoxide and other harmful materials into harmless compounds. Replacing a catalytic converter can be costly, so have the engine checked as soon as possible by a certified mechanic. A failure in the emission control system. The emission control system contains many active sensors that work to reduce the amount of pollution released into the air. One of those sensors is an oxygen sensor that reads the air and fuel mixture. If that mixture is out of the acceptable range or if you have a faulty sensor, it won’t provide the correct data to the computer and the check engine light will go on. Brittle, cracked or worn spark plugs. Worn spark plug wires can lead to an electric misfire inside the engine. If the wires are worn out, they should be changed as soon as possible. A loose gas cap. When it’s loose or cracked, fuel vapors leak out and can throw off the whole fuel system. Sometimes when the cap is put on incorrectly the check engine light will come on. 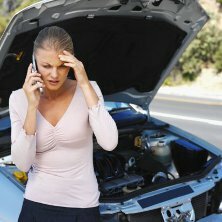 If the light stays on for more than a day or two, have your mechanic run an on-board diagnostic to see if there is a code in the system indicating a more serious problem. Check engine lights help you and your mechanic to keep your car running smoothly. So the next time your check engine light goes on, don’t ignore it. Come in and see us or call (303) 691-2760 and let us help. Filed Under: Denver Auto Repair, Engine Tagged With: Why Is My Check Engine Light On? I recently purchased a classic car. What can I do to make sure the engine will last longer? I just bought a used car and I don’t know if the previous owner kept up with regular oil changes. How can I make sure my car engine is clean? These are just a couple of the reasons why someone would be interested in having a car engine cleaning service. Over time, your engine can develop sludge, which leads to reduced horsepower and performance, and ultimately a shorter engine life. Infrequent oil changes, combined with stop and go driving can cause a sludge to form inside the car engine and on its parts. A formation of sludge can lead to problems such as reduced oil circulation, restricted oil passages. It can also cause sticky valves, lifters and piston rings. These symptoms can also occur just by having a car that has a lot of miles on the engine, 75,000 or more. When anyone comes into our shop and has noticed any of these symptoms going on with their car, we will usually recommend an engine cleaning service. An engine cleaning service uses pressure to eliminate virtually all of the old motor oil in your engine-rather than relying completely on gravity to drain the oil. 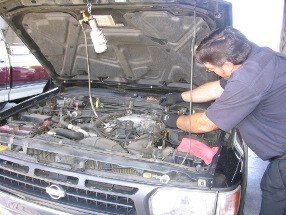 A skilled technician will remove the old oil filter and attach the engine oil system cleaning equipment to your car. This equipment will circulate the existing motor oil and the engine cleaner through a filter and remove the sludge and contaminants from your car engine. After all the contaminants have been removed, then our technician will install a new oil filter and refill it with fresh motor oil. After you’ve had a car engine cleaning service, maintaining regular oil changes at recommended intervals will help you keep your car engine clean. Come in and see us or give us a call at (303) 691-2760 for all of your auto repair needs. Some parts of your vehicle are easy for you to see and there isn’t any problem deciding if they need replacing. You can glance at your washer fluid tank and tell if its low and needs to be refilled, it isn’t difficult to tell if your headlight isn’t working or if the tread on your tires is wearing down and you need new tires. But there are some parts on a vehicle that are more difficult to see and need to be maintained on a regular basis so that they don’t break or stop working unexpectedly. Replacing your timing belt is one of these parts. Your timing belt usually gives you no indication of wear or that it is about to fail- it simply snaps when you’re driving and leaves you stranded. This can be a major inconvenience and cost quite a bit of cash, if you have to have the car towed to an auto repair shop. So how can this be avoided? Regular maintenance checks. The timing belt is a ribbed band of rubber, reinforced with strands of fiberglass, which controls the timing of your engine’s camshafts. The camshaft is the shaft that opens and closes the intake and exhaust valves. These valves let in the air that creates the combustion and also vents the exhaust that is created by the combustion. 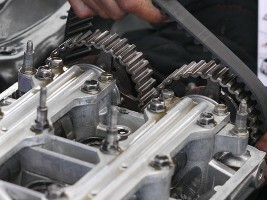 The timing belt connects the crankshaft with the camshaft and is the only part that keeps them in sync with one another. If the timing belt breaks, the car has no other option than to shut down. Replacing your timing belt at the proper time can save yourself a lot of problems. Most vehicles recommend replacing the timing belt between 60,000 to 75,000 miles, but it’s a good idea to check the recommendations made specifically for your car by its manufacturer. If you discover it’s about time you replaced your timing belt, click here for a special coupon and come in and see us. I’m finding it hard to except that summer is almost over and it’s time to get back into a “normal” routine! It is only a week away from Labor Day and that, for the majority of us, signals the official end of summer. This seems to be the time of the year that we try to collect ourselves, get our head back in the game and make a mental or physical list of the things that need to be accomplished before we can finally ” settle in” to our every day lives. One of the first things I have put on my list is an engine tune-up! Maybe that’s because I run an auto repair shop, but I’d like to think that it’s because I realize the value of my engine and I want to keep it in peak condition. The best way, I believe, to do that is by having regular oil changes and service checks and by having an engine tune-up performed on my vehicle at least once a year. Although engine “tune-up” is considered by some an outdated term, we still know and understand what it means. Our engines need to be inspected carefully and checked out to make sure they are running properly. Most of today’s cars are equipped with an electronic ignition and at least one, on-board computer that automatically adjusts the fuel mixture, ignition timing and the idle speed. All of these components need a thorough inspection to make sure they are working correctly. This is the best way to maintain peak engine performance or to restore the engine to its original operating efficiency. 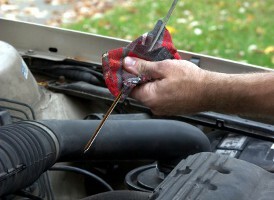 During a tune-up, your engine goes through a process of inspecting, diagnosing and testing. As well as having parts adjusted or replaced depending on whatever is necessary. A tune-up also includes removing and checking the spark plugs, cleaning or replacing them and installing them in the engine. The car’s distributor cap and rotors are checked for wear and cracks. If there are any cracks, moisture is allowed to seep in and can cause corrosion of the metal, which can cause the car to misfire. It’s important that these parts are replaced at regular intervals or if they show excessive wear. The idle speed will also be set to your vehicle’s specifications. Each of these procedures are included in an engine tune-up, but now would be the perfect time to have the other systems in your car checked out as well, such as brakes, clutch, fuel lines, belts and hoses. That would make your ” To-do” list a little bit shorter! Come in and see us or give us a call at 303-691-2760 and let us help you take care of your car. How is Your Car Cooling System Working? We have been having record breaking heat here in Denver and throughout our state. There have been major wildfires and severe drought conditions and it doesn’t look like the record heat is going to be changing any time soon. Since we usually use our air conditioning a lot more during the hot weather, it’s even more important we find out, “how is our car cooling system working?” Is it functioning properly so it can do the job it was designed to do? A typical car driving down the highway will produce enough heat to warm two average-sized homes! That is a lot of heat! This is the amount of heat that needs to be diverted away from your car’s engine to keep it running the way it is suppose to run. The job of your car cooling system is to maintain a constant engine temperature whether the air temperature outside is 100 degrees or 5 degrees below zero. If the temperature of the engine is too low the car’s emissions will go up and you will get lousy gas mileage. But if the temperature of the engine gets too hot and stays that way for too long, it will cause costly damage and great inconvenience to you. If you would like to avoid all the inconvenience and damage that a faulty cooling system can cause or you would like to know more about how a car cooling system works, read our blog “Is It Time For a Cooling System Flush? Then give us a call at (303) 691-2760 or come in and see us and let us know what we can do to help. Filed Under: Car Maintenance, Denver Auto Repair, Engine Tagged With: How is Your Car Cooling System Working? We all want to do our best to maintain our cars and do everything that we can to keep them running smoothly. And one of the parts that needs to be maintained is the timing belt. The timing belt has an extremely important part in making your engine run. 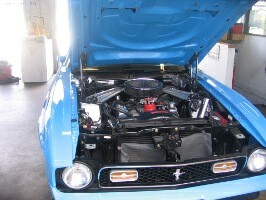 The timing belt controls the camshafts in the engine. The camshaft is the shaft that opens and closes the intake and exhaust valves that let the air in that creates combustion and also vents the exhaust created by the combustion. This opening and closing of the valves has to be perfectly synchronized with the movement of the pistons. The instant at which the valves open and close affects the engine performance, fuel economy and emissions. This is why the timing belts function is so important. The timing belt is the only part that keeps the camshaft and crankshaft in sync. In some engine designs, the timing belt may also drive other engine parts like the water pump and oil pump. Timing belts are typically made out of rubber that has been reinforced with strands of fiberglass, this makes them nearly unstretchable and extremely strong. But after rotating around the crankshaft and camshaft millions of times, the strands become brittle and may begin to break. The reinforced strands crack and give way, the belt snaps, and your engine stops. This can happen without a lot of warning. Sometimes there might be a rattling noise from the front of the engine but that isn’t always the case. The best way to avoid being stranded is to check your manufacturer’s recommendation for a timing belt service and have it replaced when they recommend it. If you drive an older car or put a lot of miles on your car, it might be a good idea to have the timing belt service sooner rather than later. Some manufacturers may also recommend replacing other parts, such as the water pump, at the same time as the timing belt because the additional cost to replace the water pump is small compared to the cost of having to access the timing belt twice. If you would like more information or a coupon for a timing belt service, look at our When to Replace Your Timing Belt blog. For all of your Denver Auto Repair needs, trust Express Car Care. Call (303) 691-2760 or stop by our shop today.